Size of Male: 110-160 lbs., 23.5-27 in. Size of Female: 99-145 lbs., 23-26 in. The Dogue de Bordeaux is more popularly known as the French Mastiff. The pooch has such an enormous head that a caesarian operation is often required during birthing. This intimidating breed comes in two varieties: the larger Dogue and the smaller, now-extinct Doguin. If you have every seen the movie Turner & Hooch, you have seen a French Mastiff. Tom Hanks played Scott Turner, a police investigator, and Hooch was played by a dog named Beasley. If canine movie stars interest you, visit our famous dog names page for an entire list of fun. “Dogue” simply means “mastiff,” while “Bordeaux” refers to the French city where the breed became established as fighting dogs. Their progenitors were believed to be the Molossers which bested jaguars, bears and bulls in the ancient Roman Coliseum. Before the 20th century, there was no uniform variety of this dog breed that existed. The purebred variety sported a red mask and a brownish nose. The black mask of the contemporary dogs indicates the presence of other bloodlines, including those of the Mastiff and the Bulldog. Apart from dog fights, the breed also excelled in game baiting, hunting and real estate protection. The Dogue de Bordeaux possesses a dual personality and is not to be taken lightly. On one hand, it is gentle and affectionate. On the other hand, it is a canine of sheer aggression and power when provoked. French Mastiff puppies start out rambunctious and become reserved as they mature. The dog is definitely meant to be more than just a family pet. Constant personal interaction and early socialization are essential to prevent behavioral problems. Living Environment – The adult Dogue de Bordeaux is generally lazy indoors and is tolerant to apartment living. However, the breed does better with a large yard. The pooches are particularly prone to heatstroke and will require a regular supply of clean drinking water. Grooming – The French Mastiff is a heavy drooler. Expect to towel off saliva regularly from the dog and from your own clothes – especially during feedings. Fortunately, coat care is easy for the short-haired dog, which doesn’t require daily combing. Diet & Exercise – Bloat is a common problem in this large dog breed. Many experts recommend a raw diet and fresh fruits. At least 10 percent of the diet must include organ parts. While varied protein sources are suggested, it’s best to introduce them one at a time in weekly intervals to monitor any allergy triggers. Chicken and turkey are top choices. The dog is prone to canine hip dysplasia, so it is not wise to allow your dog to gain too much weight and to overwork the bones. Monitor puppies younger than 2 years to avoid overexerting themselves. The breed has moderate exercise needs, which can be met through jogging. 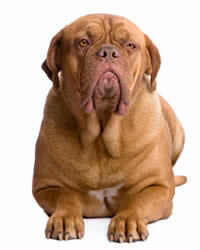 Health – Though courageous and known to come out on top of dog fights, the Dogue de Bordeaux is relatively short-lived. Bloat, hip dysplasia and sensitivity to hot temperatures are common problems. Many dogs also succumb to heart complications, epilepsy and cancer. For the Dogues de Bordeaux, dog training is the most effective with a dominant trainer. You will not find them disobedient the moment they see you as their pack leader. Although of average intelligence only, the pooches are eager to please. They excel in watch dog sports as well as in obedience training. The best advice: Start early. This our boy Kingston, a Dogue de Bordeaux. Hes 19.5 months old and about 145 lbs and still filling out.